Playamo is an online casino run and designed by casino enthusiasts for their fellow bettors, and is one built to cater to fiat and Bitcoin players. 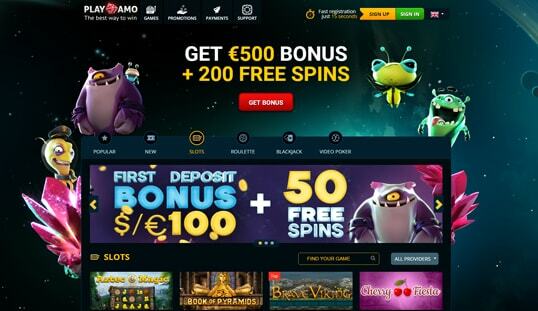 Run by experienced online casino players and long-time betting enthusiasts, Playamo is a reflection of the right elements wanted in an online casino. It caters to fiat and Bitcoin payments, further becoming an ideal betting platform of the modern times. Playamo is operated by SoftSwiss, a reputable provider of Bitcoin casino software and solutions. This automatically makes the casino a licensed brand and regulated by Antillephone N.V. Unlike certain online gambling sites that explicitly prohibit players from specific countries, Playamo passes the discretion to the players themselves. This means that bettors from regions, except for the US and its territories, where online gambling is prohibited by the laws of land shouldn’t avail themselves of the fiat and Bitcoin gambling services on board. 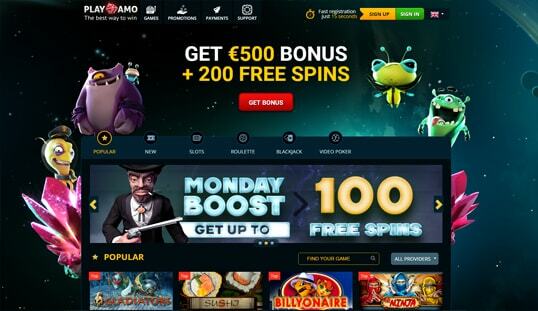 If you’re looking for virtual casino games then Playamo should be on your list. It offers a wide selection of games, including the popular online slots and the classic favorites roulette and blackjack. There are other games in the library but expect the majority to be comprised of the in-demand games. Granted that the site uses the SoftSwiss platform, you’ll find the casino games that have earned the share of the market through the integrations into numerous online gambling sites. Other than the SoftSwiss games, Playamo also features titles from other game content providers like Endorphina and Amatic. While having games from these developer already diversify the gaming experience found here, it can still reach a notch higher once the games from other providers in partnership with SoftSwiss go live. These are NetEnt, Microgaming, and Betsoft, among others. Making an account with Playamo is quite easy. As the site says, all you need is a few seconds. You’ll need to just give your email, a password, your preferred currency, and your country. After that, you’ll only need to wait for your verification email to confirm your account. You can then start playing. Players have a wide range of options for deposits and withdrawals. Playamo accepts credit cards and most eWallet options, as well as Bitcoin though Cubits. Deposits will be credited instantly but there is a €10 minimum for fiat currency while Bitcoin deposits need to have an equivalent of €5. Maximum deposits are set at €4,000. There is also a 0.2% transaction fee for Bitcoin transactions. Withdrawals have different rules. There is a €20 minimum withdrawal amount and a €4,000 limit. Though some of the options take several days, the Bitcoin option is processed much faster. Playamo is generous with the bonuses that it offers. 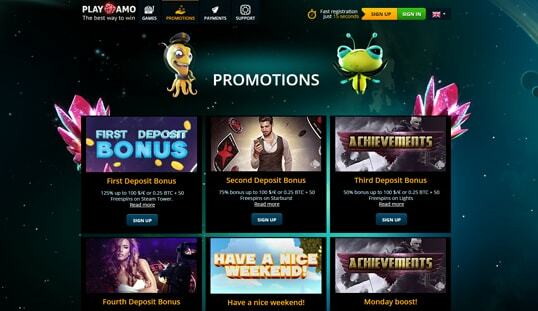 Expect your first four deposits to get a bonus with two weekly bonuses available. Your first deposit will get a 125% bonus up to $/€100, along with 50 free spins in the Steam Tower slots game. 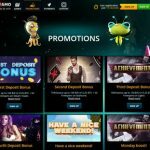 Your second deposit will also have the same mix of a bonus and free spins, although the bonus is just 75% and the spins are for the Starburst slots game. The third deposit bonus is lower at 50% and gives free spins for the Lights slot game. Your fourth deposit bonus will only receive 25% and offers free spins for the Attraction slots game. No need to worry about losing out on bonuses since you’ll still get a Monday and Weekend bonus. Every Monday, you can get up to 100 free spins in Evolution or Jack and Beanstalk slots, depending on how much you deposit. 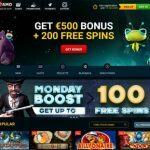 At $/€20, you get 20 free spins. 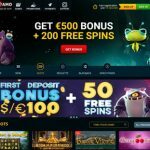 With $/€50, you get 50 free spins and $/€ 100 nests you 100 free spins. The Weekend Bonus is simpler and gives you a 50% bonus up to $/€ 50 and 50 free spins in the Gonzo’s Quest slots game. The primary methods of support for Playamo are the contact form and live chat. With the support staff available 24/7, your message should be answered quickly enough.